Under the direct instruction of Board of Leaders of HCMA in which the leading atomic is Prof. PhD. Ta Ngoc Tan as Member of the Executive Committee of the Communist Party of Viet Nam (CPV), President of HCMA, Centre for Indian Studies cooperated with many institutions of HCMA to carry out a range of activities, noticeably scientific activities. Since May 2015, two scientific conferences has been organized with positive results. 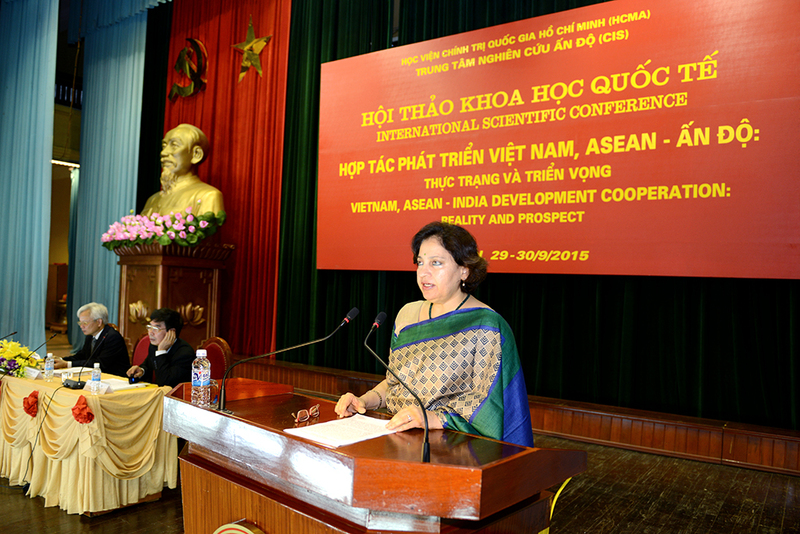 In order to promote gained achievements, in the morning of 29 September 2015, HCMA organized an International Scientific Conference “Viet Nam, ASEAN – India development cooperation: Reality and Prospect”. Prof. PhD. Ta Ngoc Tan, Member of the Executive Committee of the CPV, President of HCMA; Assoc. Prof. PhD. Le Van Toan, Director of Centre for Indian Studies; and Ms. Preeti Saran, Ambassador of India to Viet Nam chaired the Conference. In his introductory report of the conference, Prof. PhD. Ta Ngoc Tan confirmed that India and Viet Nam relationship has been standing for long and has been built by leaders of both countries through many periods. Viet Nam and India always highly regard and consent in continuing to deepen strategic partnership and comprehensive cooperation between the two countries based on five main pillars: Politics, Economics, Energy and Defense-Security, Culture-Education, Science, Techniques. After 20 years, although Viet Nam, ASEAN - India cooperation has been constantly developing, our achievements is still not corresponding with each side’s potent and desire. Prof. PhD. Ta Ngoc Tan hopes that this Conference would be a connection of understanding between sides, promotes development cooperation; contribute to save peace and prosperity for Viet Nam, ASEAN and India as well as the region and the world. Ms. Preeti Saran, Ambassador of India to Viet Nam stressed that the Conference was held when Viet Nam undertakes the role as coordinating country of India - ASEAN from 2016 - 2018; this is an important period to India. India determined that Viet Nam has been always an important strategic partner in the relation with ASEAN. With the highest priority, Indian government positively and strongly turns Look East Policy into Act East Policy; put ASEAN as central of Act East Policy and main part of India’s Asian Century dream. General matters, including analyzing and interpreting the actual state of achievements in development cooperation at politics, diplomatic, defense-security between Viet Nam, ASEAN - India recently and confirmed that this is a sustainable strategic partnership. Deeply and properly analyzing in Viet Nam, ASEAN - India development cooperation in culture, society, education - training, science and technology. Deeply interpreting the reality, potential, prospects, and barriers in Viet Nam, ASEAN - India development cooperation in economics, trade. The International Scientific Conference “Viet Nam, ASEAN - India: Reality and Prospect” is organized with purpose of analyzing, assessing, clarifying Viet Nam, ASEAN - India cooperation; clarifying achievements, shortcomings, reasons and forecasting prospects in the future. At the same time, they discussed and concurred in solutions and recommendation to promote development cooperation between Viet Nam, ASEAN and India to a new height, contribute to provide scientific foundation for planning diplomatic policies for each side. The Conference was organized in two days 29 and 30 September 2015. The Conference received 122 papers of 130 scholars from outside and inside. The Conference is divided into 3 sessions: the first session “Viet Nam, ASEAN - India development cooperation: General matters”; the second session “Viet Nam, ASEAN - India development cooperation in culture, society, education, training, science and technology”; the third session “Viet Nam, ASEAN - India in economics, trade”.